“The renewed availability of Powys’s earlier novels allows one once again to survey and admire the whole valley. 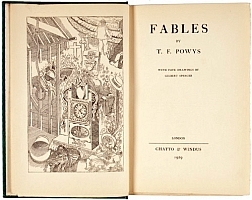 In the remote Dorset village of East Chaldon, T. F. Powys wrote a steady succession of novels, novellas, fables and short stories which first appeared in print during the 1920s and early 1930s. These tales of startling originality, strange beauty and shocking revelations, offer wry observations on the human condition, the enigma of God, and arresting insights into the nature of good and evil, infused with subtle and dark humour of the rarest vintage. 'A village is like a stage that retains the same scenery throughout all the acts of the play. The actors come and go, and walk to and fro, with gestures that their passions fair or foul use them to. Sometimes the human beings who occupy the stage, that is, the farms and village cottages, remain the same—or almost the same—for many years; sometimes they change more quickly. A country village has a way now and again of clearing out all its inhabitants in one rush, as though it were grown tired of that particular combination of human destinies, and shakes itself free of them as a tree might do of unwelcome leaves. Author of Soliloquies of a Hermit, a remarkable trinity of novels: Mr. Weston's Good Wine, Unclay, and Kindness in a Corner as well as the extraordinary Fables and arresting The Only Penitent. Among the residents of a small Dorset town called Folly Down, an unlikely struggle between the forces of good and evil is taking place. For a single winter's evening, Time stands still and the bitter-sweet gift of awareness descends upon the people. “Mr. Weston, for a common tradesman - and the most princely of merchants is only that - possessed a fine and creative imagination. And, although entirely self-taught - for he had risen, as so many important people do, from nothing - he had read much, and had written too. He possessed in a very large degree a poet's fancy, that will at any moment create out of the imagination a new world. Mr Weston is a genial old man, with a head of hair as white as wool concealed beneath his brown felt hat. He was once a writer, the composer of a prose poem, but these days it is difficult for him to find anyone interested in his literary work. 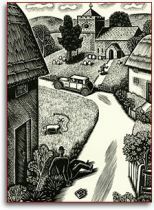 He is travelling through a small part of Dorset in an old Ford van which bears his name on its side, intent on supplying his good wine to any inhabitants willing to drink or receive some, and he is accompanied on this journey by a companion named Michael who has an unusually detailed understanding of the interests, thoughts and hopes of the locals, and who can describe at length all recent events in the area. Inanimate objects take life and animals speak in T. F.'s collection of fables, which was first published in 1929: a dish-cloth and an old pan, lying on a rubbish heap, discuss the emotional intricacies of the household that has discarded them; the efforts of a determined spinster to marry off all her furniture end in tragedy; a rabbit takes advice from a viper to avenge the death of her son. 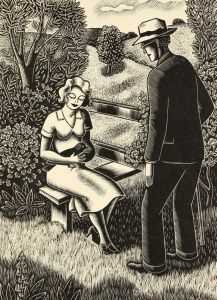 Set in the Dorset countryside that also inspired Powys's novels, these are tales of morality, original and surprising, as all good fables should be. 'IN ALL THE WORLD there lived no one who thought more of weddings than did Miss Hester Gibbs. She lived in a little cottage at Madder, and kept it so clean and tidy that not a thing was ever out of place, nor a spot of ugly dust seen anywhere. Even when Hester Gibbs was a very little girl she plainly showed that she had a whimsical mind. This mind of hers, that seemed to be settled somewhere under her dark hair— that never had a curl that wasn't as it should be—had ever pursued into many strange windings all the mysteries of matrimony. 'Even though we waves lie for centuries in the deeps of the waters, so deeply buried that no man could think that we should ever rise, yet as all life must come to the surface again and again, awakening each time from a deep sleep as long as eternity, so we are raised up out of the deeps high above our fellows, to obey the winds, to behold the sky, to fly onwards, moving swiftly, to complete our course, break and sink once more. "These stories treat of the general and unalterable, with subtlety of thought and feeling, and with simplicity of presentation. Wisdom and humour are embedded in them. They reveal the infinite mystery, the fluid inconsistencies of life. They are delicate, wiry and human. God's eyes are a-twinkle; but the main business is the incalculable doings of that oddity, Man. ... Powys's unorthodox version of Christianity reveals strands of mysticism, quietism, and pantheism, but the major influence upon him was the Bible, and he claimed that Religion 'is the only subject I know anything about'. Sometimes savage, often lyrical, his novels and stories explore universal themes of Love, Death, Good and Evil within the microcosm of the rural world. In spite of the apparent realism of his settings, Powys is a symbolist and allegorist". (From the Preface to God's Eyes A-Twinkle by Charles Prentice. KINDNESS IN A CORNER is among the most purely enjoyable of T. F. Powys’s books and is thus a good introduction to its author’s rustic world. On the face of it a quaint and mannered piece of amiable literary whimsy full of touches of light satire, it introduces us to an absent-minded scholarly bachelor clergyman, devoted to his books, to his armchair, and to his dinner, a man who lives in a benevolent tranquillity cared for by a tactful housekeeper and protected by the resourceful sexton, Mr Truggin. The setting is the village of Tadnol and the author provides Mr Dottery’s parishioners with dialogue in the picturesque tradition already familiar from the novels of Thomas Hardy; and the narrative proceeds through simple statements of fact, authorial rejections and apothegms of a tendentious nature – altogether a relaxing literary methodology. The scene conjured up is just such a one as the more acidulous imagination of M. R. James had already subjected to invasions of a malign and preternatural character, and the Reverend Silas Dottery seems clearly marked out for disturbance in his serene and comfy corner. But the disturbances turn out to be of a humorous and farcical character rather than of a disabling kind. UNCLAY the author's last novel and final masterpiece is a work of great originality and imagination. 'My name is Death,’ answered the man. A similar allegorical journey or imaginative quest for ultimate reality is undertaken in Unclay, Powys's last novel, which can again be read on different levels: psychologically, as a search for identity and self-knowledge; philosophically, as an examination of the relation between love and death; artistically, as an exploration of the creative process and the way we as readers respond to it, and (most importantly) as a religious quest in search of the ground of man's being. In Unclay John Death, whose appearance and behaviour remind us at times of his medieval predecessor on the stage, visits a Dorset village in order to carry out the divine command to 'unclay', that is to kill a pair of young lovers and two villains. Both he and the narrator present love throughout in terms of pain and sorrow, which can only be alleviated by Death, 'God's best gift', since it releases us from the burden of life (the pensum vitae) and the bonds of time. This theme is dramatically presented in the transfiguration scene at the local churchyard, where John Death is seen to divide the living from the dead: "upon this side, the folly of passion, suffering, and pain . . . upon the other side, the sweet silence of God. Although love and death are depicted as opposing forces, fighting each other like husband and wife, they form actually an indissoluble pair. Then the change comes in life. The first change - the forerunner of Death - is Love. When the sun of Love rises, and a man walks in his glory, he may be sure that a shadow approaches him - Death. Love creates and separates; Death destroys and heals. This quotation highlights the novel's central paradox: Death is both love and death, pain and peace, existence and non-existence. In my view, Unclay is Powys's crowning achievement, since it contains the fullest artistic expression of his meditations on life, beauty, evil, love, and death. An excerpt from MODERNITY AND MEDIEVALISM IN T.F.POWYS'S MATURE FICTION by Marius Buning originally published in Year's Work in Medievalism 5, 1996. JOHN GRAY is Emeritus is an English political philosopher with interests in analytic philosophy and the history of ideas. He is formerly School Professor of European Thought at the London School of Economics and Political Science. Gray contributes regularly to The Guardian, The Times Literary Supplement and the New Statesman, where he is the lead book reviewer. 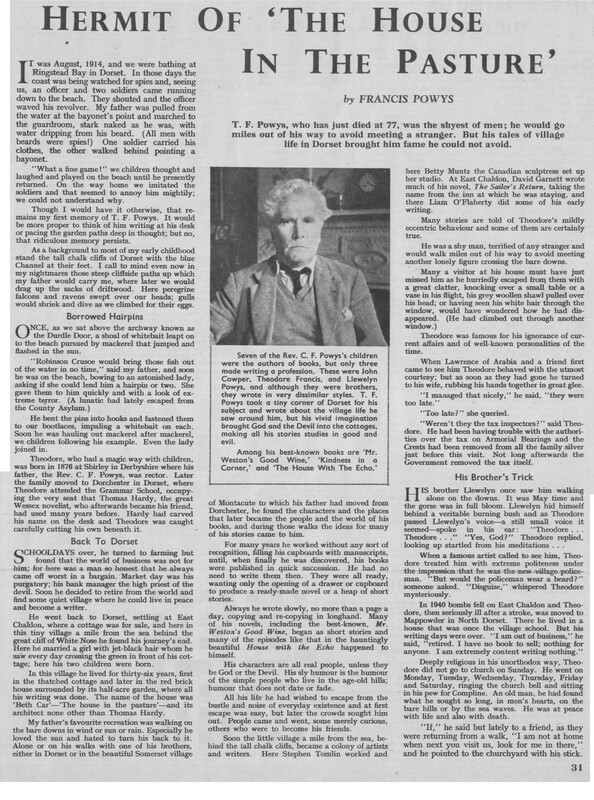 T. F. Powys, an English Tolstoy? Powys began to write Mr Tasker’s Gods during the First World War, almost a decade before its publication. It alludes darkly, more than once, to what was going on elsewhere in the world, perhaps not that far from Powys’s home on the coast of Dorset – across the English Channel, say – without referring to it directly. The style is typical of early Powys (much admired by Q. D. Leavis, who quoted approvingly and at length from Mr Tasker’s Gods in Fiction and the Reading Public), a thing of biblical cadences and a plain yet resonant vocabulary. Like David Garnett, Sylvia Townsend Warner, T. E. Lawrence, Liam O’Flaherty and other literary mavericks, Dennis Wheatley responded strongly to this earthy, unfashionable fiction, calling Powys the “English Tolstoy”. Others called him a heretic; Frank Kermode saw him as, above all, an ironist. His brother John Cowper Powys repeatedly hailed him as an “original”. From: ‘T. F. Powys, an English Tolstoy?’ by Michael Caines. Read the full article in the TLS here (link will open in a new window). 'With the first lighting of a cottage candle a man becomes an entirely new being, and moves in a totally different world to that of daytime. He is now born into a world whose god is a rushlight, and a man’s last moments in this world generally come when the light is extinguished and he creeps into bed. Every common appearance that during the day the vulgar sun has shown, becomes changed by candlelight. For now a thousand whimsical shapes, dim shades and shadows, come, that no daytime has ever seen or known. The bright sun of heaven that has made all things upon earth only too real is not now to be feared by the housewife as a telltale, for all is become magic and a pretty cheat. Dust upon a book or in a corner, a straw upon the floor-cloth, show now only as objects of interest. The black stain that the smoke from the lamp has made upon the ceiling becomes colour and is not unlovely. The cheap wallpaper, though wrinkled and torn, has now a right to be so, and is not regarded with displeasure. Nothing after sunset need be looked at too closely, and everything pleases if regarded in a proper evening manner. Man is drugged and charmed by this beneficent master whose name is darkness; he becomes more joyful, and thank goodness, less like himself. With the first lighting of the lamp, love and hatred, the sole rulers of human life, take a new form and colour. Love becomes more fantastical in the darkness and malice less logical, and both the one and the other are more full of the strange matters that dreams are made of. This formalist-narratological study of T F Powys' and V S Pritchett's short fiction re-establishes both authors as important contributors to the history of the short story form. It also discusses how writers, who did not belong to the modernist avant-garde innovation, address the problems of the short story form in the twentieth century. The study takes a close look at the uses of the ordinary and analyses character, setting, and event presentation, narrators, audiences, narrativity, eventfulness, causality, and narrative rhetoric. It presents two kinds of short fiction and two kinds of the ordinary: the ecstatic one, focused on violations of norm, and the static kind that reassures its patterns. Contents: The ordinary in literature – The short story – Non-canonical short fiction writers – Modernism and the canon – Formalism – The rhetoric of narrative, narrativity, eventfulness, character presentation, causality – Social realism – Polemics with realism – Stasis-ekstasis as an organizing principle of narrative.